SHARE Your guests will be delighted to receive one of these delicate folding fans decorated with a silver scallop design. They will add a classy finish to your summer occasion when personalized with a name and date. Add a beautiful touch to your event tables with these pretty white fans decorated with a silver scallop design. The fans are fashioned from a light colored wood and feature a stunning intricately carved design. They have a collapsible ribbing structure with an outstretched silk fan attached. Folds into a compact shape and looks stunning when open! Add a unique touch to the fans by using personalized clear stickers, showcasing your name and the date of your special event, creating a high-class gift that will be treasured for years to come. Assembly required - Stickers come on easy peel sheets sized at 8.5" x 11"
Can you use a separate font for the personalized sticker? Only the design options listed on our site are available. I'm sorry, we're not able to change the fonts from what's pictured for each line of this Personalized Celebrations Silver Scallop Folding Fan Favor. Hello I would like to make an order for a customized fans. I am proceeding with the purchase however, I did not get the option to add the writing & color that I want to add. How can I do that? 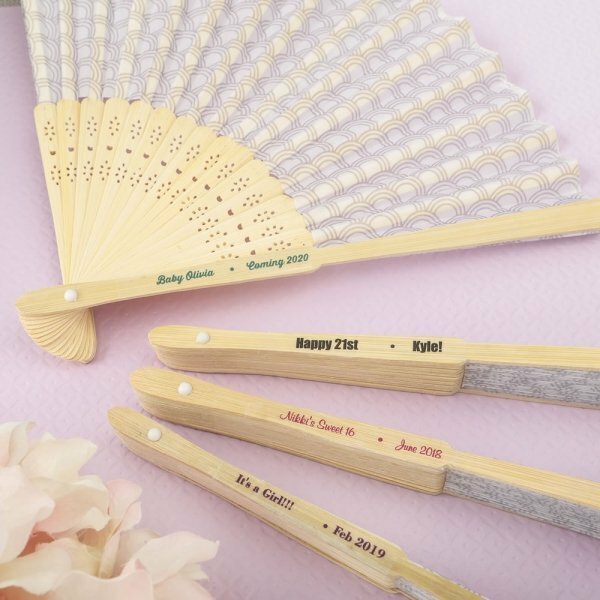 You should see the option to customize the Personalized Celebrations Silver Scallop Folding Fan Favor under Personalization, which you will see after adding it to your shopping cart. Click the 'complete the missing info' button under personalization. You can personalize the font color, and add names or the date of your special event, creating a high-class gift that will be treasured for years to come.